Slickwraps 60% Off Sale This Weekend! 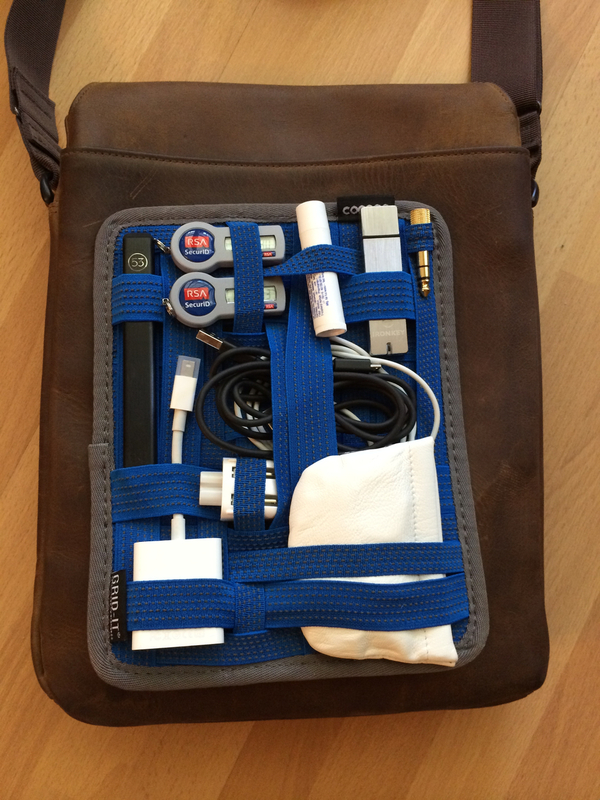 This review is of the Muzetto Leather messenger style bag by Waterfield Designs. Some people (including my own kids) call this a "man purse" but I call it necessary. I like to be able to carry everything I need with me so I can get things done without being in the situation of..."I don't have that VPN token and adapter, so I'll do it when I get back to my desk". For several years I have been carrying around the Chrome Classic Messenger and even after years of use and abuse the darn thing still looks brand new. So why did I feel the need to switch bags? Two main reasons...I had heard about this new bag that Waterfield had come out with called the Indy. It was a bag designed after the bag that Indiana Jones wore around in all of his movies (how cool is that?). So I had this bag on my wish list for quite some time, but just couldn't justify spending $180 on a bag. Fast-forward to this past Christmas where I had some Christmas cash given to me as presents (apparently I'm tough to buy for so I get a lot of gift cards and cash). I finally decided to pull the trigger on a new bag. But what about my 2nd reason for wanting a new bag? The 2nd reason was that my existing Chrome bag was just a little too big and most of the time I couldn't find anything in it. Isn't that the whole purpose of carrying things around with you...you know, finding and using those things when you need them. The main decision I had to make is on which size of bag to get. I have an iPad Air and a 13" MacBook Air that I needed to carry in the bag so the 13" Laptop Muzetto seemed like the right choice. However, it turns out that the size of the 13" bag was designed to accommodate both a 13" laptop and and case around that laptop. I carry my laptop around without a case so I didn't need the extra room, but was the next smaller Muzetto bag going to be big enough for a 13" MacBook Air without a case? I did a ton of searching on the web and it was really tough to figure this out. I wanted the smallest bag I could get away with so at the end of the day I had to take my chances and just order the smaller 11" Laptop Muzetto and hope for the best. As you can see from the picture gallery above my MacBook Air fits nicely within the bag and the flap on the bag still closes quite naturally over it. Perfect fit in my opinion. Remember that Indy bag that originally got my attention? It was way too small to carry a full-sized laptop around in, so it just wasn't going to work for me. But that's when I I found this other great bag that Waterfield Designs makes...the Muzetto. The other choice was material (go with leather or waxed canvas) and I went with leather. I carry my bag both for work and around on weekends so I needed it to be both rugged and professional looking. The rugged leather makes it perfect to be able to carry around for the day at work even for those rare times that I need to wear a coat and tie but it also looks at home with me when I'm running around with it on weekends in shorts and a tank top. Who is this bag for? If you are looking for a good quality bag for the least amount of money THIS IS NOT A BAG FOR YOU. You must be willing to pay for quality. I don't want to come off as elitist here. This is not some bag made in China that is pumped out of some production line. This is a hand-crafted bag made right here in the USA (San Francisco) so you are paying for the kind of detailed attention only a human hand can give to a product like this. $179-$259 is not too much to pay for a bag that you use day in and day out in both professional and casual settings. This thing is with me at all times so I wanted it to be something I really love carrying around. The other important aspect of this bag is that it is a minimalist bag. You must be willing to make tough decisions about what you carry with you and leave the rest somewhere else. This is a very slim bag and is not made to stuff it full of things. The whole concept behind this bag is for it to be incredibly slim and professional looking so be prepared for that. So I tried the baby powder fix and it worked like a charm. For a while I had to reapply the baby powered every few weeks and now I apply it every couple of months (if that). The easiest way to apply the baby powder is to sprinkle some of the baby powder on a Q-Tip and then use the Q-Tip to apply the powder to the top of the D-ring where the ring rubs against the shoulder strap. I have to admit, this was a pretty big drawback against this bag. I'm not sure why this happens other than I think in order to have really high quality materials (rather than some kind of coated plastic) you end up with materials that will rub and need to be broken in. Since I intend to carry this bag for a very long time I don't mind breaking the bag in a bit and applying some baby powder from time to time as needed. A small price to pay for something that will hold up against abuse for a long, long time. Originally I bought a Waterfield Gear Pouch, but I found that having just one main compartment in the pouch and a small zippered pocket wasn't enough options to store all the little pieces in such a way that I could actually get to them quickly. So for Christmas my wife had a rather brilliant idea and she bought me a GRID-IT (specifically she got the 7-inch small iPad case version CPG7). A GRID-IT is basically a small rectangular flat board (it is very soft but stiff) that is made out of a bunch of interlocking woven rubberized elastic bands. You then shove your small items under one or several of these elastic bands and the bands hold these items in place against the board. The GRID-IT that my wife got for me fit nicely into the back pocket of my Muzetto and holds all of the little objects that were forever getting lost inside my old Chrome bag or the one of the main compartments of the Waterfield Gear Pouch. Buying a bag like this is much more of a personal decision rather than a technical-based one. All I can do is explain what led me to making this purchase in hopes that it will help you make a similar decision. This bag isn't for everyone, but it has ended up being the perfect bag for me. I will also say that having a bag like this one with a really nice slim but padded pocket to carry around my iPad Air in was a deciding factor for me to NOT use a case with my iPad Air. Another really big plus for me with just how much smaller and slimmer this bag was, as compared to the Chrome I used to carry, was for airline travel. The Muzetto is so easy to toss over your shoulder and take on a plane. It fits so nicely under even the smallest airline seat allowing room for you to put your feet under the seat in front of you in addition to the bag! Like the content here at 1WaySwim? Consider clicking below and leaving something in my "Tip Jar." Donations help keep small blogs like mine up and running and free from annoying ads.